The CoffeeShop Blog: Sorry I haven't been around as much! Sorry I haven't been around as much! So you might have noticed I haven't been posting as much. Honestly, moving really messed up our routine and I got a bit (ok, completely) overwhelmed with everything and haven't had the energy to spend much time on the computer. So right now I am concentrating on making this new house a home and spending as much time with my family. Luckily it is a great time of year to get out and about with all of the local festivals and great weather. This weekend we went to a vintage car festival and had a wonderful time. I could care less about any of the new cars out there, but if I had the time and money I would love to have a vintage car. Perhaps a Mustang or a Camaro. I love the muscle cars, but I also can't pass by anything with giant fins without slobbering a bit. I even saw an El Camino that I was ready to hop in and drive home. I have always had a secret crush on those old El Caminos. If you look carefully you can see all of us in the bottom right bumper. We have also had some not-so-exciting changes. Poor Imp has a few run-ins with decks and trees and finally damaged his front tooth enough that it had to be extracted. 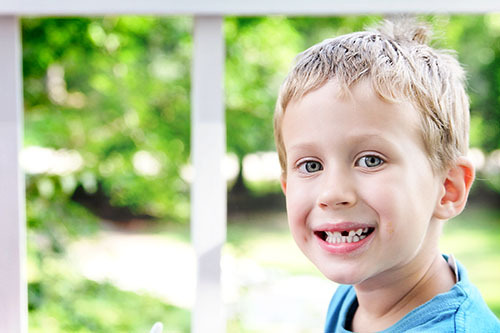 I felt bad about it, but I have to confess he is pretty darn cute without that tooth. It gives him a bit of a tough guy image. Like "You should see the other guy". You know, Imp would look great driving in that black El Camino we saw this weekend. I hope everyone is having a great week. And I wanted to personally thank everyone who visits and reads my blog and tell their friends about it, have purchased my download packs, made donations, and had me do their blog designs. Thanks to all of my amazing readers I am able to help support my family while keeping everything on my blog free!!! Still need a baby pic? Not very staged, quick snap, but he's got lots of red splotchiness! I think he's adorable with or without teeth!! It's very neat to watch your boys grow on your blog. Makes me feel as though we are friends even if we've never met. Thanks for all you do the help others. Moving can be so incredibly stressful & everyone forgets about the part of assembling the new home together. I can completely relate. Donna said . . .
LOVE the vintage car photo!!! Beautifully composed too. 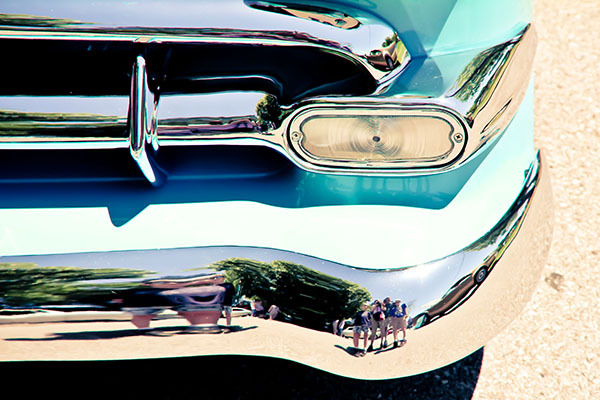 Loved how you focused in on the details, chrome and color and captured yourselves in the bumper reflection. And the color tones are so rich and creamy. Did you use one of your actions? I feel happy just looking at this photo. I, too, swooooon over classic cars!